Remember my 2 new boy cats, Tomi and Gica? Well, one of them, Gica, the orange one, is gone, gone baby gone. My father took them(Gica and Tomi) outside (for the first time in a few months of winter of staying only indoors) while I was at work and after thinking that they both were hidden in the garage, he realised that Giga dissapeared. It's been a few days now and it didn't come back. Tomi was brought in the house now and now an then my parents take it outside. Every time I see Tomi I remember Gica's disappearance, because they were inseparable. 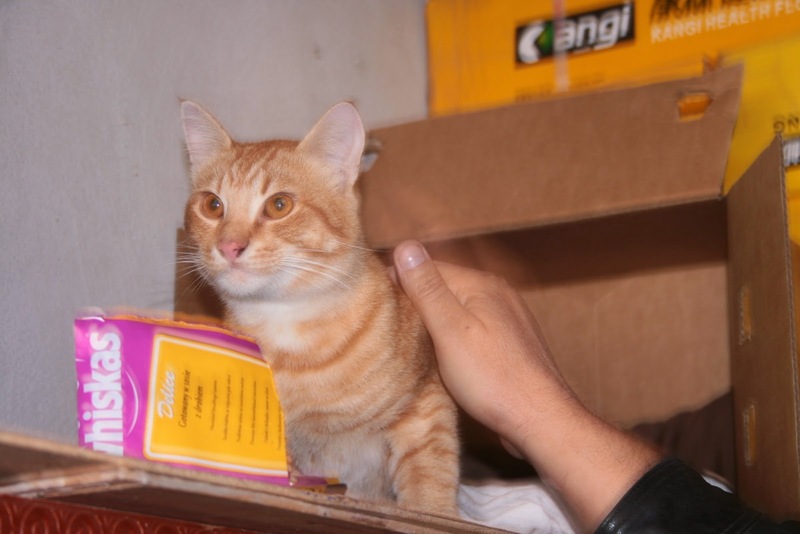 When we took them from our neighbor Mirela we thought that it will do them good to be 2 brothers to experience the arrival in a new home, and we thought well, they were doing all things together, sleeping, doing naughty things and especially eating together. But now Tomi is alone. We've lost about 2 nights of sleep because Tomi was crying and searching hopelessly for his brother trough the house in the middle of the night. It calmed down in the meantime and it's good that it still has Suzy, our other cat that stays indoors, and it hangs around with her now, her and the big cats, us. Now every time I'll see a tabby cat I'll remember Gica. Before this when I saw a tabby cat I remembered another Gica, my gradfather's cat, an old and wise cat very experienced in living outdoors. That cat is also gone, died of on old age. I named this Gica in rememberance of my gradfather's cat. I just found out this morning that Gica is at our neighbor house, eating with our neighbor cats and running away when anyone tried to approach it. At least we know it is good, although there is little chance for Gica to come back home as it runs away when we try to catch it. It's been a wild cat since it was little, we can't cage it's little free spirit by holding him only indoors. I hope the best for it and hopefully it will live a long life in our vicinity. 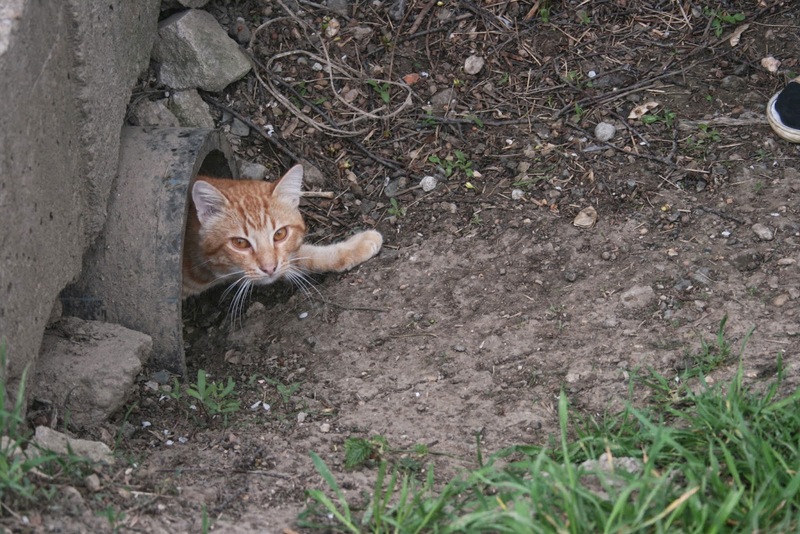 I've seen Gica, he hides in a open pipe near the street, close to our home, my mother took me to it; it broke my heart to see it like this, it looked weak and more mature. My mother took it some food and water and managed to touch it, but not to grab it. She hopes that my father when he arrives home will try to convince Gica with food to return at least to our courtyard. I feel so much pity for it, but it feels like I've given up on it, not like my mother who still has hopes. I pray that she is right. with food and my father took it back home. But indoors Tomi bite it and they both started crying so my father took Gica back outdoor, in the garage and gave it the rest of the food. After it ate it Gica went hiding under the armchair in the garage. We left it there. It knows there is food in the garage, it must know that it is loved by us, it's its choice if it stayes or leaves again. But I ponder what does a poor little cat know about choices and what's best's best for it. Gică is living in our garage for a while now, it eats cat food, it gets out on its own and patrols the garden and the yard, it ignores the two dogs, which is good it means that it isn't afraid, stays to be petted while eating and sometimes while it is in the garden too. I'm happy to know it safe in our yard.